Google Chrome supports browsing without saving third-party cookies or browsing history on PC. This feature is named incognito and is very much similar to the Firefox private browsing. When we start Chrome incognito window, it will stop storing cookies, visited page history, passwords entered, download logs etc. Once we close the window, all these information will be removed automatically. It means the next user will not find any browsing activity of the current user. This article is about different methods to start incognito window and browse without leaving any history. 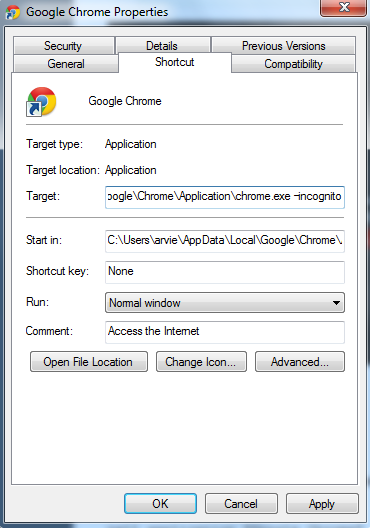 We can start a private browsing window (incognito) of Google Chrome browser by different methods. Most of the important methods are listed below. It is very easy to start Chrome safe browse using shortcut keys. We have to press the following three keys at the same time. When you press the above key combination, a new Google Chrome window will appear with the following message. This page will inform you of the specialty of the new window. If you want to learn more about this feature, you can click on the 'Learn More' link. When you select Chrome from Windows start menu, you will get the option to start either normal window or incognito window. You can start Google Chrome Private Browse from Customize menu. To do it, follow the instructions below. Now onwards, whenever you need to start browsing without storing any third party cookies or offline log information on the laptop, double click on this shortcut. It will open a private browser window and no browsing history will be stored on the computer. Google warns us, using incognito will not make us secure from other Internet threats. It cannot protect our data from websites which collect information from our computer by installing malicious codes. Agents who work with ISP can track our Internet activities unless we encrypt the entire communication. Incognito is also helpless against Malicious software products like Trojans or keyloggers if they are already installed on computers. Keylogging tools can track every keystroke we make on a PC and either store the details or send to its server. Private browsing feature of a browser cannot prevent this activity. However, we can prevent the auto saving of cookies and browsing history on our laptop using the incognito feature. Even the download activities will not be entered to the download log file. In a nutshell, though this feature will not give anonymity of full safety, it is worth than browsing using a normal browser window.